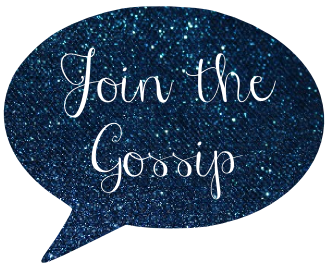 Join The Gossip: Jackie O. 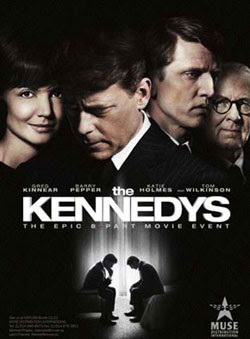 Did anyone else watch The Kennedys? It's been a great series so far and all of the actors are doing a fantastic job. JFK was a great president, despite his many personal flaws. And Katie Holmes looks so much like the First Lady! As I watch I can't help but lust after the clothing worn by Jackie. 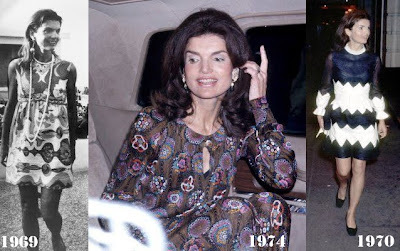 Jacqueline Lee Bouvier Kennedy Onassis, better known as Jackie O. after her second marriage to Aristotle Onassis, was not only an amazingly strong woman but was also well known for incredible fashion sense. Perfectly tailored, Chanel dresses, a string of pearls, and short wavy hair is how she was seen in her early days. As she aged her signature look was still simple, chic but more patterns were introduced. Her big, over sized glasses are probably what she's best know for as far as fashion goes. What do you prefer, Jackie's style as First Lady, or in her later years? She is so fabulous it's insane. I think I prefer her earlier years, but she still looks amazing in the seventies. I can't stand how incredible her style was! I wish I had the cojones to just dress like that every day, but instead I will just watch The Kennedys and Mad Men and dream! 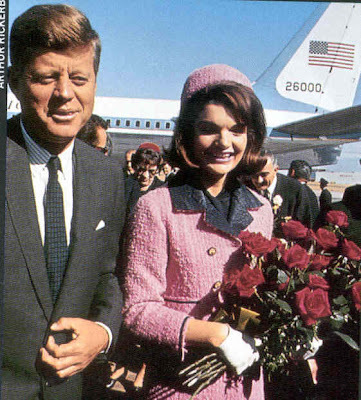 i didnt catch this, but i love jackie o's style and presence :-) hope u had a nice weekend! I missed it! Hopefully it will show up on Netflix because I wanted to see Katie Holmes in this part. 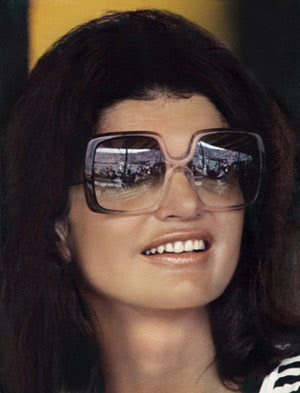 I prefer Jackie O's earlier style, I think -- a bit cleaner. ohhhhhh i wanted to see this!!! - i forgot all about it!!!!!! - i love her classic style n how it has ALWAYS been so stylish! -- and PS i can't wait to see ur post about the garden parties - this one was FABULOUS! - i gotta post more pics of it! I haven't seen it but I would be interested too! I can't believe how much katie does look like her though, that is crazy.. Thanks for reminder - I've been wanting to check this out! Looks interesting! haven't a chance to watch it. I've always been such a huge fan of the Kennedys! I read as many biographies as possible in high school. And Jackie is just perfection. I love her First Lady style! Love seeing all these pictures of her and I would love to see the movie with Katie Holmes portraying her. And awesome sunglasses! 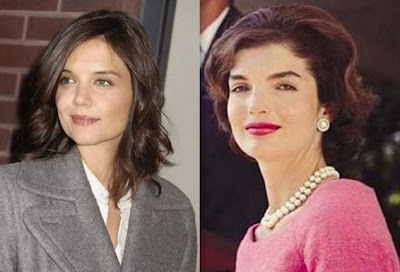 I haven't been watching the series but Katie Holmes resemblance to Jackie O is uncanny. I do prefer her style in the early years, but oversized sunglasses are always a must. I have it dvr'd but have not had a chance to watch it yet. I like her first lady years best! Just classic. Her style was so incredible! I love the whole lady like look. I can't believe I missed this! gr. Seriously, Katie homes is wonderful, and so so beautiful. Ohh! I do like her as first lady. She's looks so elegant and glamourous. Though she still looks great in the later years too. I think it is uncanny how much Katie looks like Jackie. And I am glad I received this post in my email this am! I like Jackie's style all-round however, her later years stand out to me. PS - I linked you up today. I haven't seen the show yet, but will have to check it out online. 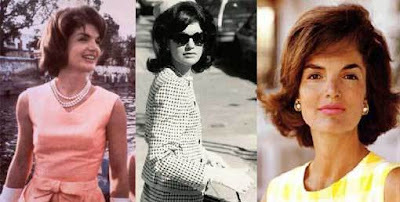 Im a huge Katie Holmes fan and I adore Jackie O's style. She was such a classic woman. Her style was beautiful. Seeing Katie holmes' picture next to jackie o's picture is very interesting. I never knew how much they look alike!